Q: Is there something deep about Salt, doc? I’m serious. I really wanna know. A: Salt is vital for life. It’s pretty much as key as water. As you may know, they give you saline when you’re dehydrated… and that’s not just straight H20. And salt gives things flavor. Jesus told his disciples to be “salt and light.” That’s all pretty deep, in a spiritually-significant sort of way. Oh, wait. You were talking about the movie, weren’t you? Yeah, there’s some of that there, too, I suppose. Christians really aren’t boycotting Bill Murray after all. American Idol host’s father angles for Hollywood screenplay. Next up for director and star of The Apostle: Get Low. Inception is about planting ideas in people’s minds. One good idea from the production’s set? Warner Bros. and director Christopher Nolan used solar-powered generators from Pure Power Distribution. 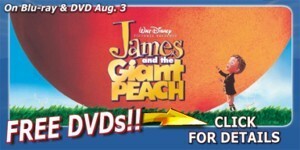 Courtesy of Disney Home Entertainment and HollywoodJesus.com, you can be one of three lucky GHM News readers to win a DVD/Blu-ray combo pack of the adapted children’s classic James and the Giant Peach, out on DVD and Blu-ray August 3.